Learn more about Asian cuisine in this inspiring cooking class! Our Asian cooking class mainly focuses on Thai, Vietnamese and Cambodian cuisines. Asian cuisine is perhaps the most extensive kitchen because it involves many different countries, which makes it difficult to cover them all in one cooking class. So we decided to cover these three delicious kitchens to make up our Asian menu. 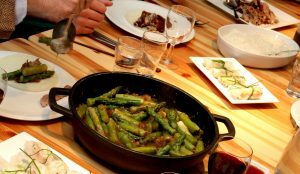 This cooking cooking class is being held in one of our cooking studios in Amsterdam. For more information call or email us directly by the contact form. In total there are about 8 to 9 different dishes made. Classic dishes such as tom kai, beef curry and Vietnamese summer rolls naturally belong to this menu. During the Asian cooking courses, two tasteful appetizers are also made, a corn biscuit and fish cakes that are served during cooking class. Just like in our other cooking workshops, Asian cooking class also includes a number of basic cooking and cutting techniques. In this Asian cooking class cooking rice is also an essential part of the menu. Upon arrival everyone gets a drink and a bite, after which the aprons are handed out and the menu is explained. The price per person is € 75.00 including wine. It starts at 6 PM, and is finished around 10 PM. We require a minimum of 8 registered participants for this class.